Celtic ended Glasgow City’s 34 match unbeaten run with a 2-1 win after extra time in the Quarter Finals of the Premier League Cup. 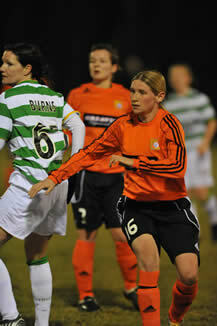 City opened the scoring on twenty minutes when striker Lisa Evans converted a City corner at the near post. However, with eight minutes to go, City were punished for not killing off the game, when a mistake by the City defence, allowed Celtic’s Jo Love through on goal with just the keeper to beat, and the Scotland internationalist made no mistake from inside the box. Extra time followed and with City piling on the pressure with numerous corners and free-kicks, Celtic strode up the park and striker Suzanne Grant hit a 20 yard volley into the roof of the City net. 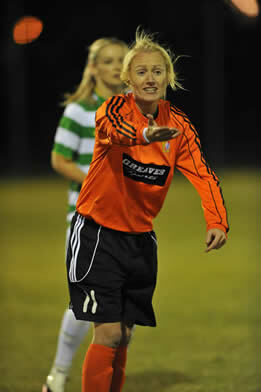 The holders continued to put pressure on the Celtic rear guard but some excellent defending and vital saves from Gemma Faye in the Celtic goal, gave Celtic a historic victory over their Glasgow rivals. Celtic will now face Aberdeen in the semi-final, with Spartans taking on Inverness in the other on 21st April.